The rate of sea level rise is accelerating around the world. While the exact pace of future sea level rise is not yet certain, there is every reason to believe that sea level will continue to accelerate throughout this century. Much depends on how much more greenhouse gas pollution humanity adds to the atmosphere. It also depends on how quickly the Greenland and Antarctic ice sheets melt and add their water to the oceans in response to global warming. The National Oceanic and Atmospheric Administration (NOAA) has recently released revised scenarios of sea level rise, as well as estimates for sea level rise beyond the year 2100. The NOAA report points out that it is essential for planners to account for the worst-case scenario as well as the most likely scenario when considering risk in decisions. 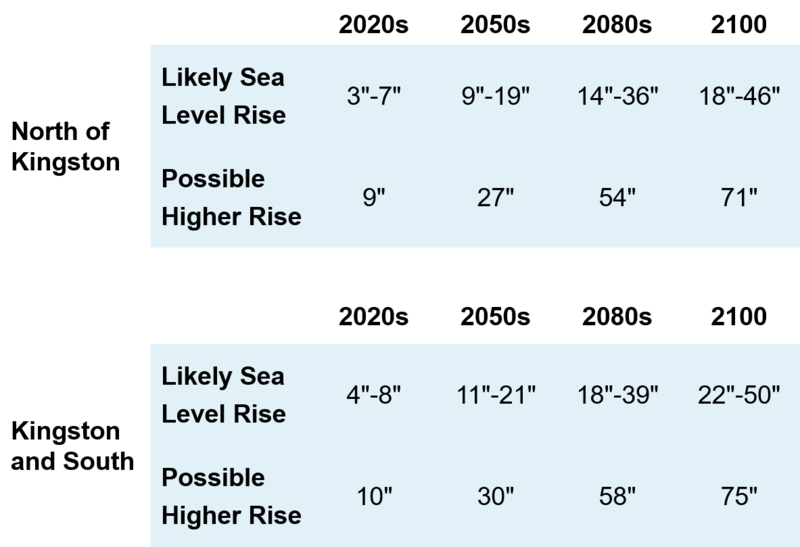 * The range of "likely" sea level rise is the amount of sea level rise that is between the 25th and 75th percentile of ClimAID model outputs, i.e., it is unlikely that sea level rise will be below the lower limit or above the upper limit of this range. "Possible" but unlikely sea level rise is above the 75th percentile of the ClimAID model outputs. For additional guidance and science related to these projections see Science Resources. The numbers above are interpreted from the Community Risk and Resiliency Act, accessible HERE. Access the NYS Sea Level Rise Task Force Report HERE and the NYS 2100 Commission Report HERE.